Five species of Polygala are recorded in Britain. 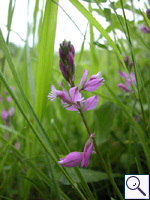 These include the native Dwarf Milkwort (P. amarella), Chalk Milkwort (P. calcarea), Heath Milkwort (P. serpyllifolia) and Common Milkwort (P. vulgaris). The BSBI provide a downloadable plant crib for Polygala. Two British miners recorded on Polygala. A key to the European miners recorded on Polygala is provided in Bladmineerders van Europa. On Polygala vulgaris in Britain and in addition Polygala chamaebuxus elsewhere. Known only from Surrey in Britain. Also recorded in the Republic of Ireland. Widespread in continental Europe. Liriomyza polygalae Hering, 1927 [Diptera: Agromyzidae]. 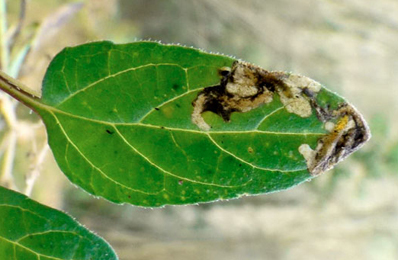 1b > Leaf-miner: Rather narrow corridor, untidy and sometimes branched, starting from the base of the leaf, in particular the midrib. Sides of the corridor irregularly eaten out, not really parallel. Frass mostly present, and then in a central line. The larva is capable of leaving the mine and start a new one elsewhere. These later mines are much broader, and the frass is scattered irregularly. Larva with chitinised head (Bladmineerders van Europa). Host plants unknown in Britain. On numerous genera and species in several plant families, including Polygala, elsewhere. Recorded in southern England. Widespread in continental Europe.